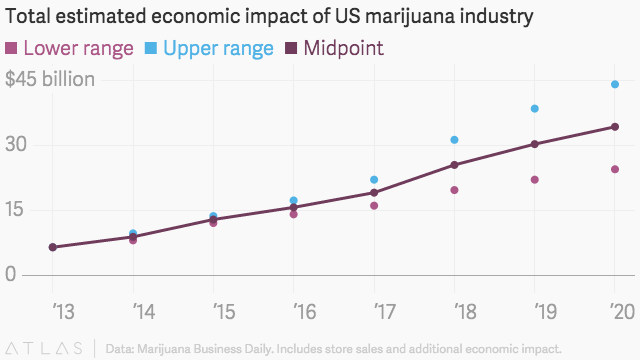 The weed industry is becoming a legitimate economic engine. 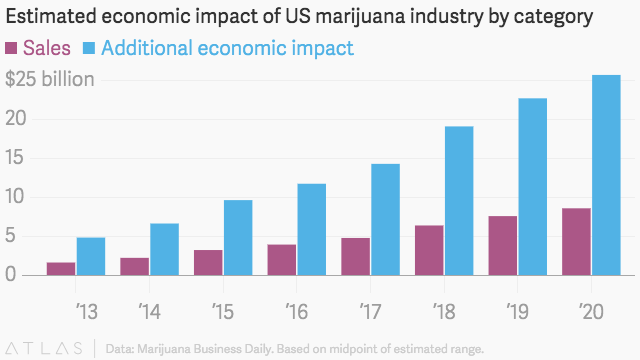 Sales of legal marijuana in the US are estimated to more than double by 2020, as is the broader economic impact of the industry, a new report predicts. Pot dispensaries are expected to pour anywhere from $24 billion to $44 billion into their surrounding communities in 2020 as rapidly growing sales drive purchases of supplies, such as grow lights and fertilizer, and create more jobs, according to the 2016 Marijuana Business Factbook, released Monday (Mar. 14.) The industry netted an estimated $12 billion to $13.6 billion in sales and related activity in 2015. Most of the economic benefit is coming from peripheral business generated by the marijuana industry. For every dollar spent on pot, the local economy around it gains $3, estimates the report, which was compiled by the trade publication Marijuana Business Daily. More than 20 states and Washington D.C. have legalized marijuana use in some form so far, for recreational or medicinal purposes. Legal marijuana sales are already a sizable industry on their own, generating $3 billion to $3.4 billion in revenue in 2015. Last year, medical and recreational pot stores outsold the Girl Scouts, which posted $776 million in cookie sales, and e-cigarette companies, which sold $1.5 billion, according to the report. Joints and pot brownies still have a ways to go in overtaking the country’s other favorite recreational pastime: snacking. Americans bought $4.9 billion in food items like Doritos, Cheetos and Funyuns last year.